REINALDO ESCOBAR, Havana. 6 October 2014 – This Sunday news agencies around the world, especially in Latin America, awaited the results of the first round elections in Brazil. The question of whether Dilma Rousseff will remain president of that vast country, simply the question, will be one of concern and anxiety to many people in Cuba and I’m not just referring to those in the offices of the Plaza of the Revolution who could see this or that project at risk, should the continuity be broken. The actual experience of political change is a phenomenon alien to our country for the vast majority of the people. 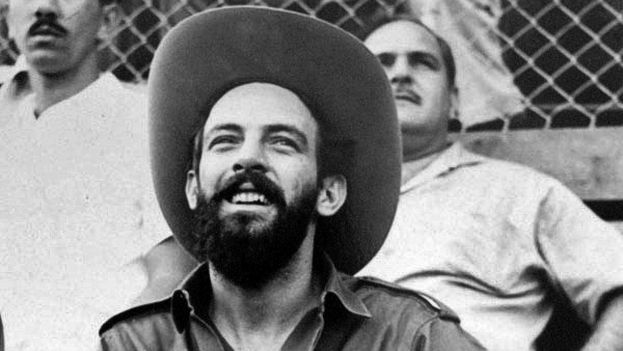 In fact the “youngest” Cubans who ever exercised the right to choose between one president and another, are now 88-years-old, because they would have had to be 21 in 1947, which would have allowed them to choose between three candidates: Eduardo Chibás, from the Cuban People’s Party (known as: Orthodox); Juan Marinello, for the Peoples Socialist Party (Communist); and Carlos Prío Socarrás, from the Authentic Party, who was ultimately the winner of that last contested election. Since then the concept of elections has become fuzzy, especially since 1976 when citizens were led to believe they would become voters, because they could approve a slate of candidates created by the will of those who were unwilling to relinquish power. What is curious is that the commentators of whatever media, privately owned by the Communist Party, will speak with the greatest naturalness of the matter of 26 October, when the mystery of the Brazilian second round elections will be cleared up. They will address the subject without daring to say a single word that would make their readers wonder why Brazilians and other Latin Americans have that right and we do not. If the multi-party system is that “multi-trash” system that renamed the only ex-president still alive, the re-election of Dilma Rousseff should also be considered illegitimate. If Aécio Neves emerges as the winner, they will have to turn to one or more psychiatrists to explain, with the “maneuvers of imperialism,” the irrevocable decision of a free people. 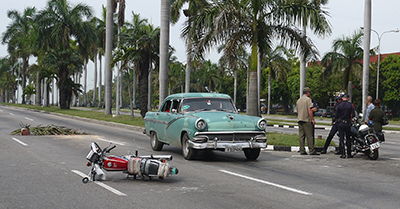 Street people in Havana and Bueno Aires. 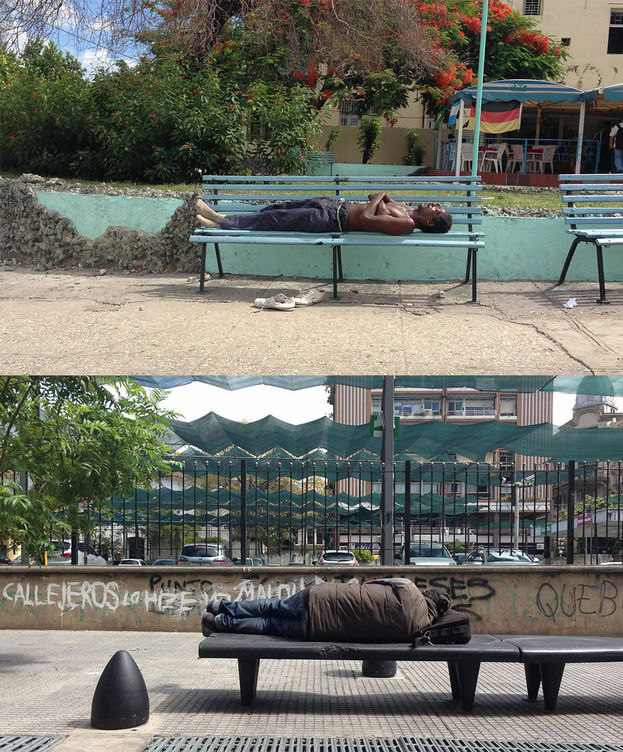 In the two photos that I compare here I am not intending to insinuate that it’s the same in Buenos Aires as in Havana, because there will always be people sleeping on the street. The Havanan (or maybe he is from another province) who sleeps shirtless in the full sun on the centrally-located Avenue of the Presidents at the corner of 23rd, in the heart of El Vedado, has left his shoes in reach of anyone who might steal them, figuring, perhaps, that there’s no one more poor than he. The pants he is wearing are tied with something that clearly isn’t a belt, and one could wager that he has ingested a goodly dose of alcohol. In the background, a reminder of the World Cup, the Argentine flag flies accompanied by one from Germany and another from Brazil. The Argentine (probably an immigrant) protects himself from a slight chill with perhaps too many clothes and has something like a briefcase for a pillow. His image could illustrate the drama of many unemployed, people who have seen their lives shattered with the latest crisis. Behind him are more or less luxurious cars, contrasting with his misery. On the walls are the libertarian slogans of some graffiti artists that nobody has bothered to paint over. The street looks clean and everyone who passes by ignores him. If they are sleeping they are dreaming of different, but equally unattainable, things. There are many who try to imprint their pronouncements with the hallmark of official discourse. To blend in and achieve uniformity with that language, they select certain words, certain phrases and investigate ways to say typical newspaper articles, academic dissertations or legal allegations. One of the most recent linguistic elements of this nature consists of a curious pairing in which one part is the concept of “risk perception,” and the other part is “vulnerability.” Meteorologists, epidemiologists, traffic safety specialists, economists, don’t hesitate to say that to the point that the perception of risk is higher, one can reduce the vulnerability of the presumed victims of a danger. I confess my ignorance of the origin of this equation, which not only seems logical to me but even lucid. I suspect that it has been imported from an international academic environment — perhaps from military strategy or scientific language — when some clever member of a Cuban delegation was caught out there sowing it in the fertile ground of lack of originality in the official phraseology. The funny thing is that the verbal combination is not indebted to either Marxist dialectic or the harangues of the barricade. It’s implacably cold, but catchy.Try it yourself and confirm it. Say, for example, that the lack of information in our press about criminal acts noticeably reduces the perception of risk that a person in the street should have and, as a consequence, increases the vulnerability of a citizen to criminal attacks. The triumphalist tone of the ministerial reports to the Cuban parliament don’t allow an adequate perception of the risks that threaten our society, which leads to greater vulnerability, be it with regards to the economy, education, healthcare, tourism, or anything else.If we think of all the vulnerabilities that open before us, like cracks on the edge of the abyss, when the lack of perception of risk posed by transparency, secrecy, the verticality of command, the lack of citizen participation in decisions, the absence of political debate, the penalization of dissent, in short, it’s scary.Perceiving the risks, decreases our vulnerability. Almost 27 years ago the magazine Somos Jóvenes (We Are Young) was born. That edition was historic because of the publication of two investigations, one, The Sandra Case, about prostitution, and the other titled Academic Fraud? In that era we were able to publish a note in the state-owned newspaper Juventude Rebelde (Rebel Youth) announcing the launch of the controversial magazine. Under the title Academic Fraud? we unmasked one of the negative phenomena of our society, which went far beyond that committed by the students facing their university exams, and manifested itself in other sectors that had nothing to do with the teaching process, at least formally. Supported by a wide investigation, where there was a survey of students at different schools, Academic Fraud? renounced the expositive style to immerse itself in analysis, provoking among its readers a wealth of questions and solutions. 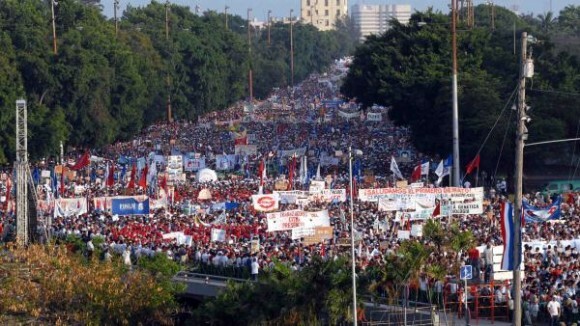 27 years later thousands of young Havanans were forced to retake a Mathematics exam to get into the university, because the contents of the exam had been leaked and a still unknown number of students had acquired it, in many cases for pay. I would like to invite the author of that investigation, Luis Manuel Garcia, to update us on his opinion. And by the way, I recommend reading what he published in this regard in August of 2009 in his Habaneceres* blog . *Translator’s note: The lead off to this post (in Spanish) is that 280 students were surveyed and asked if they had ever committed academic fraud (i.e. cheated), and 280 admitted to having done it at least once. Official institutions should do what they promise they will. If this institution is the most official of all and the promises touch on essential matters, then the inescapable obligation is almost solemn. 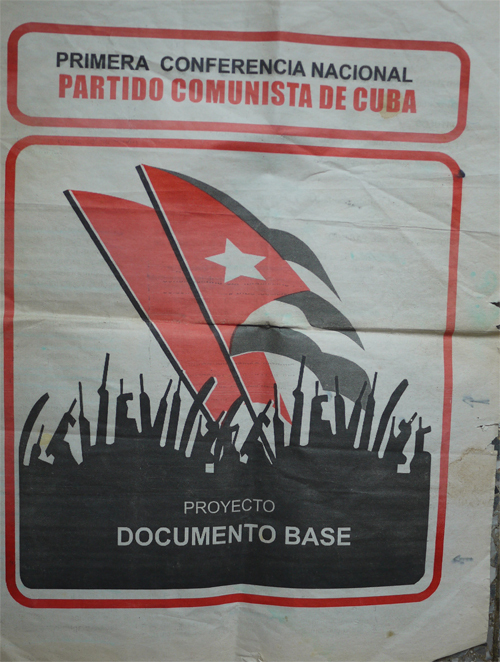 With the members of its organization and with the people whom it governs by law, the Cuban Communist Party has at least two outstanding obligations, both of them contracted during the First National Conference, held on 28 January 2012. One of these is already drafted, “the conceptualization of the fundamental theories of the Cuban economic model,” and the other is the renewal of the Party Central Committee by at least 20%. This theoretical conceptualization would have to establish the nexus between the Marxist-Leninist doctrine, which charts the course of the socialist system, and the guidelines issued by the Sixth Congress. It would have to explain that they are not using the rusty arms of capitalism to build socialism, but rather, although what they’re doing now looks like the rules of the market, in reality it is actually central planning and the profits foreign investors will earn, fruits of the labor of Cuban workers, will come not from goodwill, but something that will have to be named in some way. 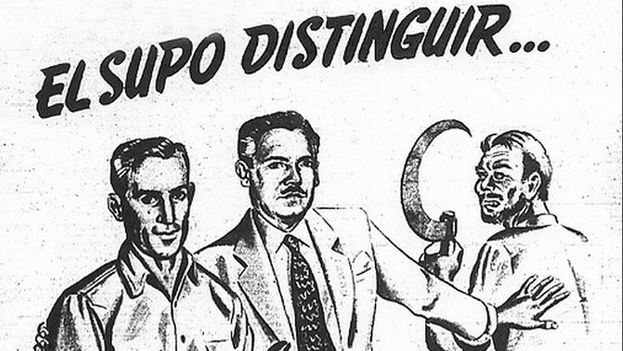 With regards to the second outstanding debt, “refreshing” the Central Committee, many expect that this 20% renewal includes at least the retiring of the octogenarians and the acceptance of a different code for the new meritocracy, where the participants in the struggle against the prior dictatorship or those present in the heroic tasks for the first years would no longer appear. Thus there would be Central Committee men and women who never fired at another human being, nor confiscated anyone’s property, nor even risked their own lives for the cause. I wonder how many PCC militants have raised, among the Party’s core, their concern about this slowness in meeting such elevated commitments. I wonder how many Cubans remember those promises and how many see some kind of hope in their fulfillment. Some might say I have a good memory. Actually my memory is bad. Very bad. As Yoani Sanchez has already announced, midweek this coming week a new digital medium, baptized 14ymedio, will see the light. We have the intention to update it daily and, if possible, more than once a day. When the Internet becomes, for Cubans, something simple and accessible as it is for every other 21st Century Latin American, perhaps them we’ll be on the list of favorites of housewives who want to make a dessert, of entrepreneurs who want to know where to invest their money, or why not to, of politicians who need to know the trends in public opinion. Visiting us will be those who are looking to make plans to amuse themselves on the weekend, and those who want to be up-to-date on the latest theater offerings, the best concerts, the newest releases in the bookstores. We hope to be a reference for every Cubanologist who needs to check a precise date or submerge themselves in the conceptual complexity of the new social thinking, and a reference as well for the absent-minded tourists hearing the name of the country for the first time in their lives. A window into what is happening, our fingers on every pulse, the re-visitor of history, a messenger from the future, all this is what we want to be. Just because most people will have Internet we won’t begin to be a people without problems, and so 14ymedio proposes to be the voice of the protestors, those persecuted by whatever power, and, most particularly, the longed for space of all those who have a divergent or convergent opinion but who lack a public platform where they can expound on it and submit it for discussion. Obviously these are long term intentions, but we are starting now because we don’t want the new and inevitable realities that will come to wait for us. In fact, we are not the first to have such ambitious dreams, nor to work to conquer them. Hopefully we won’t be the last! With no desire to be paranoid, I want to warn that the peaceful opposition and civil society in Cuba could be on the eve of a very dangerous moment. I remember the 2003 Black Spring shocked public opinion in the midst of the American military intervention in Iraq. Today the Cuban government seems disposed to “loosen” the repression a little to put itself in sync with the European negotiators, but all this could come to a crashing halt if the conflict in Ukraine provokes a confrontation between the NATO member countries and Russia. When Cuba’s loyalty to Russia becomes an unacceptable insult to Europe, we will remember the era of the European Common Position on Cuba as a honeymoon. Then there will be no one who promises or pretends that human rights are respected on the Island. The legacy that the “historic generation” wants to leave to its successors will be a very difficult burden to carry, but an even harder one to drop. May the Lord have mercy upon us. “Raul: the earth isn’t trembling, but we are. I also doubt–forgive me brave souls–that the necessary dose of courage could be assembled, even to dare subtleties like these. However, these play-on-words would be harmless jokes, if on the platform they had the gift of reading what is in the minds of those who march (not to mention what those who didn’t attend were thinking). If the invisible posters (by some miracle) soon materialize, then there would be others who would begin to tremble. My former colleague Jose Alejandro Rodriguez who aptly handles the Letters to the Editor section in the newspaper Juventud Rebelede (Rebel Youth), last Wednesday published the comments of a reader annoyed by the absence of beer in the snack bars and markets. Since I noticed the absence of this refreshing liquid a couple of weeks ago, I supposed it would be difficult for anyone to venture to complain about its lack because, if he did so, the intrepid one would betray himself as a consumer of a product considered luxurious in our complex trade relationships. I remember when our the first hard currency snack bar opened in our neighborhood and the commentators agreed that it would be counting on people who were spending their “bucks” on something that wasn’t a basic necessity. Life demonstrates that we were wrong. 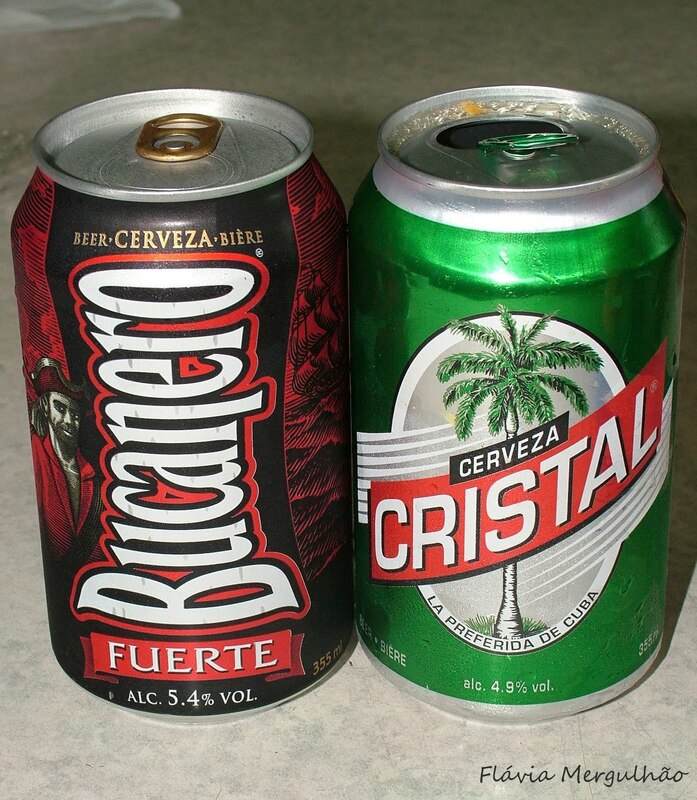 Despite the fact that a worker who earns 480 Cuban pesos a month has to work 8 hours to give into the whim for a cold brew, it’s clear that neither Cristal nor Bucanero can be considered privileges of the new rich. Why, in the midst of a campaign against secrecy, haven’t our media gone and knocked at the door of those who are obliged to give an explanation? Is it because from the top management of the Department of Revolutionary Orientation no one has sent down the order to address the issue? Or perhaps it’s because no official journalist dares to confess that he himself drinks a brew from time to time or has anything to do with those who do. I myself have been a victim of this unspeakable guilt complex that leads us to give the impression that we are not even aware that beer is missing. The unborn body of this New Man, who failed among us, usually appears as a ghost to give us a fright when we are about to make a consumer misstep. Touch wood!